The first work by Rosario Cabrera (1901-1975) I remember seeing is the oil portrait of a little girl, reproduced in the catalogue of the exhibition organized as a tribute to the Open Air Painting Schools (EPAL), at the Museo del Palacio de Bellas Artes in Mexico City in 1981. The girl is seated, holding a piece of paper in her hand. The painting displays careful drawing and a balanced composition; the fragile body occupies the right side of the canvas, towards the lower left corner, leaving ample space on the opposing side to accentuate the private world and the candor of the subject. She has delicate features, her elongated and melancholy eyes look straight at the spectator. This painting remained etched in my memory, along with the artist’s name and her involvement with EPAL. I knew that Rosario Cabrera had been a teacher in those schools and nothing more. Her childhood was not easy, marked by the deaths of her parents, when she was 9 and 12 years old. Her father’s strong personality, a decorator of artistic dispositions, keen on painting, wood carving, the guitar and Flamenco—, awoke her artistic vocation, displayed from an early age in her first drawings, revealing a precocious ability to reproduce human and animal figures, both copies and sketches taken from nature. 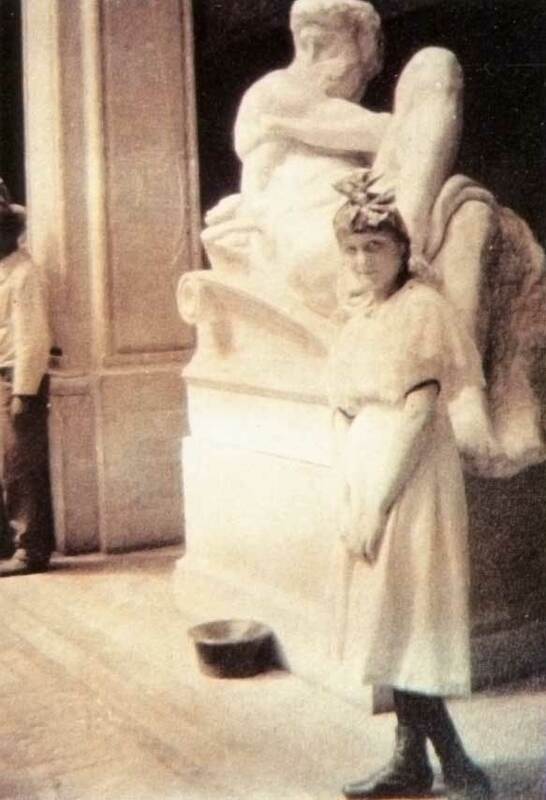 Cared for by an aunt, along with her 5 orphaned siblings, Rosario enrolled in the Escuela Nacional de Bellas Artes,where she studied between 1916 and the early1920’s. 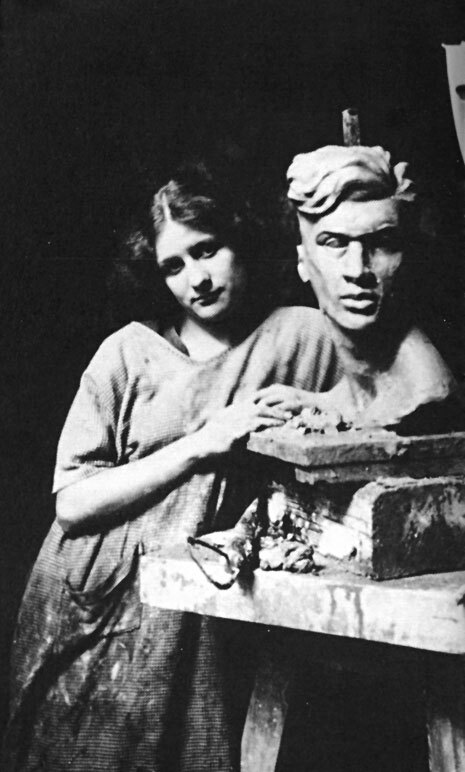 Her teachers were the painters Saturnino Herrán, Leandro Izaguirre and Germán Gedovius, and the sculptor Arnulfo Domínguez Bello, among others. She must have worked intensely, for in 1921 she had her first individual exhibition at the school, with almost 50 works. 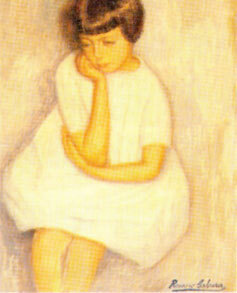 The young artist’s talent was soon recognized, and President Obregón granted her a pension. Indeed, landscapes and portraits were the two constant subjects throughout her life. In both she found ample motifs to develop different forms of expression. She frequented the former Convent of Churubusco, which in 1924 became an EPAL. The landscapes she painted there showcase the realism she had learned at the Escuela de Bellas Artes, but there are also someImpressionist works: Primavera en el valle, Arboleda e Iglesia, somewhat in the manner of Claude Monet in his Rouen Cathedral series. Her portraits make evident her acute sensibility, capturing the feelings and character of her subjects. These provide her with an opportunity to look inside a human being. These works are also a testimony to her colleagues who had a significant place in her life, ad who would go on to become remarkable artists: Fernando Leal, Julio Castellanos, Gabriel Fernández Ledezma and Nahui Ollin, or friends like Lupe Marín and Mirella Asúnsolo, among others. Her portraits are execute with a sure hand, reflecting a firm knowledge and a skilful use of proportions. Some are painted in an Impressionist manner; others seem to be unfinished, because they are made as quick sketches, deliberately leaving some areas unpainted. These works also show a certain disregard for the support of the paintings; in some she used simple cardboard. Another set of portraits represents whatI judge to be her classic style: La dama de los ojos verdes, Niña pensativa and Niña con libro, oils on canvas in which the way she applies the paint reveals her intent to imitate fresco paintings. Her sculptures, on the other hand, reflect a genuine knowledge of anatomy and the use of proportions in volume, such as in an outstanding group of heads of old and young men, and a self-portrait, all of the realist in style. We are undoubtedly in front of a great artist, who mastered the line and color technique as well as modelling. 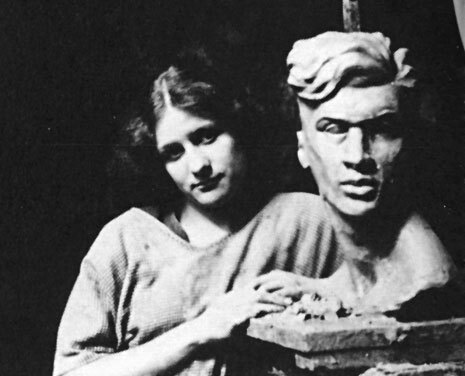 Apparently, she stopped making sculptures before her trip to Europe (1924). After her return to Mexico City in 1927, there is no indication she resumed this artistic activity. Right from her student years, Rosario Cabrera had been in close contact with the painter Alfredo Ramos Martínez, the original promoter of the Open Air Painting Schools. At first she did not get involved with these schools, but her friendship with the painters who worked with Ramos Martínez —some of which would later become, like her, EPAL teachers— motivated her topractice wood engraving, as can be seen in Cabeza de Cristo ( ca.1923), Cabeza de hombre indígena (ca. 1924) and Niños en el salón de clases (undated). Taking into account these early dates, she was one of the first women wood engravers (if not the first) in Mexico in the 20th century. From November 1924 to January 1927, Rosario lived in Europe thanks to a pension granted to her by the Secretaría de Educación Pública “to enable her to visit the most important centers of European art, thus stimulating her creative abilities, since she is regarded as a rising star in Mexicanpainting.” (Carla Zurián, “Cronología”, in Rosario Cabrera: la creación entre la impaciencia y el olvido, catalogue of the exhibition held at Museo Casa Estudio Diego Rivera and Frida Kahlo/Museo Mural Diego Rivera, Mexico City, January 20 – March 29, 1998, p. 104.) During this journey she felt especially attracted to Gothic church architecture, cities, bridges and towns with narrow streets, as can be seen in several drawings, paintings and engravings. In her work during this period there are no large artistic aspirations in display, nor the desire -as in Diego Rivera- to identify with the leading artistic trends of the time. Her interest was focused on Mexico, as attested by her loving involvement after her return with the Open Air Painting Schools, between 1928 and 1931. By the late 1920’s, these schools, which had known some moments of expansion and prestige, were increasingly criticised by artists and intellectuals who questioned their goals and relevance. Rosario Cabrera joined in the schools’ defense from a singular standpoint. For her, this meant her full engagement with arts education, becoming the first (and only) woman painter to have been director of two EPAl: at Los Reyes, in Coyoacán, and Cholula, in the state of Puebla; on the other hand, this brought about a significant change in her visual language. During this time she painted works reflecting the spirit and the spontaneous and sometimes naïve expression of her pupil’s works. She painted landscapes around the school in Coyoacán, favouring the first impression of nature in the eyes of the artist. El niño pintor synthezises, fully and lovingly, this phase in her career: a boy in overalls is seated on a mat (the boy’s body and the mat are impeccably drawn); he is engrossed, painting on a piece of paper a rural house surrounded by trees under a blue sky. Behind him, a fragment of a painting can be seen, possibly made by the boy as well,although it reminds us of other works by Rosario Cabrera in those years:El burrito amarrado, Establo, La nopalera and Casa de Los Reyes, Coyoacán. I find it especially compelling that a young woman from a well-off background should engage so lovingly with her pupils’ lives. In some photographs we can see her with a simple dress and her long tresses, instructing some of her students under the bright sun. Rosario Cabrera knew she had a special artistic talent which had given her prde of place among her contemporaries. Her life, however, was free of vanity and selfishness, and she devoted herself to the training of future artists.